Why is voting so low, and what can we do about it? Most places in New Zealand still use the First Past the Post system. Although FPP has its advocates, in my view it’s a pretty terrible system which disenfranchises people who would like to vote for less well-known candidates but don’t want their vote wasted. Unfortunately, lccal government (particularly regional councils) are moving at a glacial pace to introduce STV in their elections. Perhaps it’s time for central government to step in and with a stroke of a pen change it across the whole of the country. For those places where Single Transferable Vote (STV) is used, it has sometimes come under fire for being far too complex. Particularly in those places in New Zealand where voters are confronted with different voting systems for different bodies, when they open up the voting form it’s easy to see why confusion might arise. In some ways we are blessed in Wellington, in that all of our local bodies use Single Transferable Vote (WCC, GWRC, CCDHB) or Preferential Voting (Mayor). A criticism of STV is that it can be very daunting for people who feel like they have to rank each and every candidate running for each body. As most of you know, this is a misconception, and with STV you can choose however many candidates you want to rank. Hopefully over time people will come to understand better how STV works and this will become less of a problem. I think it’s a mistake to blame low voter turnout all on voter apathy. While that certainly may be a factor, one needs to ask why people aren’t motivated to participate: is it because they could participate and chose not to, or is it because their (lack of) financial and civic skills are creating a barrier to participation? It’s very easy to overlook the role of resources in voting. One rather vague explanation for voter apathy is that the issues “are distant from the matters which really matter to people”. I think this reflects that local government politicians (and everyone else I guess) need to do a much better job of communicating what exactly it is that local government does for people on an everyday basis. In some ways, local government has a much bigger impact on our lives than central government, and yet we generally see local politics as much less important. “The first priority is to establish a small independent panel to do a comprehensive audit of research on local elections and council- community engagement. The panel needs to collate what is known about improving voter turnout in New Zealand and identify gaps and develop a strategy for filling those gaps. How can we increase voter turnout? I think ideally online voting would be available in conjunction with our existing postal voting system so that people who aren’t technologically savvy have a system to fall back to. It will be interesting to see how the roll out of the online voting system will work in the next local government elections in 2016. A shorter voting period has been suggested by some commentators as a way of increasing the sense of voting being ‘an event’. But I think the whole reason we have a long voting period is because it’s necessary for postal voting, and unless we want to ditch that system it’s a bit of a non-starter. While long voting periods can lull people into a sense of complacency, they also allow time for people’s late voting papers to arrive, and for a few chances to send back the completed form before the cut-off. I also don’t think compulsory voting makes sense. If the underlying problem is that people don’t want to vote, then to simply compel people to vote is a very superficial response. There’s also an argument to be made that not voting is an important democratic right, before even considering what forcing people to vote will mean in terms of the quality of the voting. One solution which hasn’t been talked about much in the media is developing (and using) online engagement tools. This election saw a number of these tools, such as Ask Away, which aimed to involve people in asking candidates questions which interested and effected them. People could vote for questions they thought were good by liking them, which also had the the effect of promoting the questions on Facebook. 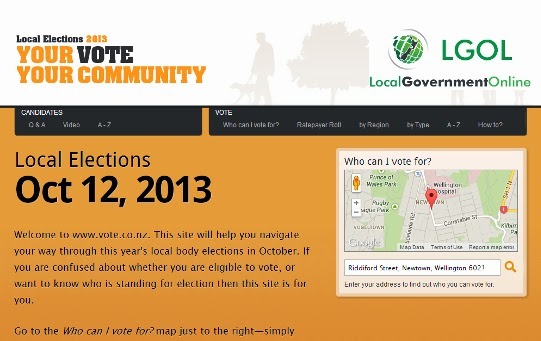 Another tool which I found quite useful was vote.co.nz. Although it was a little hard to navigate, it had a useful tool where you could enter in your address and it showed you the candidates for your area. Let me know what you think: why aren’t people voting and what can we do about it? This has also been reposted over at WCC Watch.